No more boring, white alphabet letters! Unique and individual, these very cute, personalised wooden letters are sure to add an ultra special touch to baby's nursery or a child's room. Little ones just love seeing their own name! Made-to-order, you can be assured there will be no two alike. 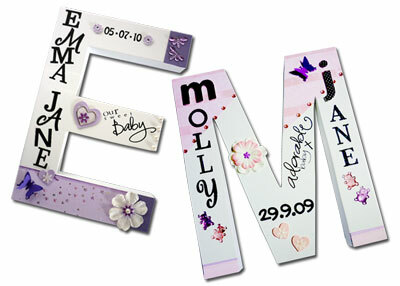 Personalised with child's first and/or middle and/or last names, plus birthdate, if desired. Please note: wording/text, pictures and embellishments are stock supply and not necessarily the same at any given time. For this reason it's not possible to request specific words, sayings or images, but rest assured much care goes into choosing the appropriate decorations to suit the child's age and your desired colour-theme.